Variations of carols' motifs written by the young composers Aurelian Băcan, Bogdan Pintilie, Alexandru Sima, Sebastian Androne, Vlad Răzvan Baciu, Áron Török-Gyurkó, DanDe Popescu, Sebastian Țună, Alexandru Ștefan Murariu and Andrei Petrache will be presented on the 12th of December, in a concert organized by the Romanian Cultural Institute in collaboration with the National University of Music Bucharest. Diana Rotaru, the idea of making a new repertory of carols inspired by the collection of Béla Bartòk's compositions is very interesting! What was the context in which this idea was born? It started from Mrs. Ariadna Ponta, from the Romanian Cultural Institute and it brought me great joy to promote the young composers' creation - just as we've been trying to do for a long time with SonoMania Ensemble - and find those less popular carol themes together. Actually, the folklore inspiration has gradually disappeared because young generations are no longer interested in it. I tried to figure out how young composers perceive the carol and how it can turn into a personal contemporary language. What do these carols reimagined by young composers sound like? Do they preserve their traditional nature? It's very fascinating! Some of them stuck very close to the original, others did the opposite. Each one of them saw the whole thing in a different way. How many composers are we talking about? Ten young composers, all of them very talented and have already made a name for themselves. They were selected through a contest. Dan Dediu, Doina Rotaru and Călin Ioachimescu, three wonderful composers were part of the jury. They chose ten composers from Bucharest and Cluj, whom I hope to hear as often as possible. What kind of sound can we expect from these new carols? 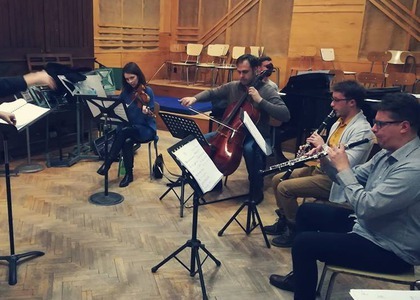 Different instrumental formations within the SonoMania Ensemble, which means Raluca Stratulat - violin, Valentin Ghita - oboe, Mihai Pintenaru - clarinet, Tamara Dica - viola, Eugen Bogdan Popa - cello, Mihai Murariu - piano. These carols will be performed on the 12th of December, at the George Enescu Hall at the National University of Music in Bucharest. Is this a one-time event or do you other projects in store? We got some fantastic news which I hope become true. We've been invited to present this project at the Modern Festival in Cluj, a very prestigious festival in April next year.